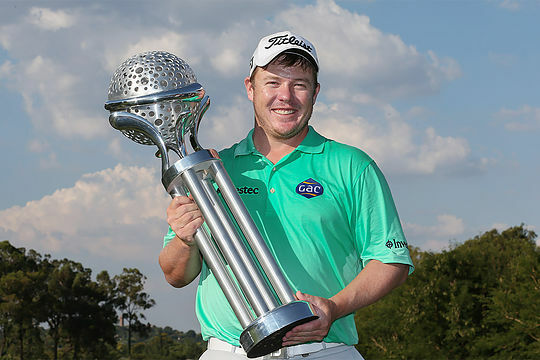 George Coetzee channeled memories of playing the host course from his junior days to claim the Tshwane Open at Pretoria Country Club. South African Coetzee won his second European Tour title, carding a flawless final round of 65 to finish one shot ahead of compatriot Jacques Blaauw, at the course where he has been a member since taking up the game and where he won his first junior competition at age ten. Blaauw charged through the field with a closing 61 and set the clubhouse target at 13-under par, with the final groups still having nine holes to play. However, Coetzee was just one behind after finishing his front nine with three birdies in four holes. The pivotal moment came on the 17th after Coetzee tried to drive the green on the short par four. His tee shot came up in the trees short and right of the green but with a clear path between two bunkers, the World Number 87 took advantage by chipping to five feet and holing for a birdie to take a one shot lead down the last. “To win at your own club in front of all your friends and family, the crowds were amazing, I could just feel the momentum building and the crowd getting bigger and bigger towards the end. It’s a great experience and a very special day for me,” said Coetzee. Blaauw’s runner-up finish was his best result in a European Tour co-sanctioned event. Australian Todd Sinnottt continued his professional golf education with a tied 46th finish at even par while poor Brett Rumford took ill after eating an apple mid-way through the tournament and had to attend hospital for treatment. Rumford had opened with rounds of 64-70 to be on the first page of the leaderboard before suffering his misfortune and was forced to withdraw from the event.